Heard around the D.C. Foodies blogosphere this week...Murky Coffee owner Nick Cho has surfaced on his website and Don Rockwell to address questions and concerns about the recent shuttering of the Capital Hill location. Cho writes that while the Murky on the Hill is indeed closed, many of the employees have succesfully moved on to other independent coffee shops and a few are working at the Arlington location. Murky Coffee in Arlington is apparently not affected by the tax problems which plagued the shop on Capital Hill. Perhaps they have a better bean counter. Apologies. Speaking of independent coffee shops, an article in this week's Washington Post's Tuesday Business section highlighted the Bean Bag in Bethesda, whose owner Mitchel Wool credits catering, and Starbucks for his success. Along with a Starbucks on almost every corner has come a heightened demand for coffee and coffee beans. The 1000-square-foot shop grossed over $1 million last year. That amounts to more than a hill of beans. Last one, I promise. Another large chain, Chipotle, is going local at its Charlottesville location by using pork from nearby Polyface Farm. Chipotle hopes to join the increasingly popular eat-local movement which has until now, generally been limited to restaurants and farmers markets. If you have looked south along the Potomac River you may have noticed a bit of contruction going on just past the Wilson Bridge, called National Harbor. Sauce on the Side reports that most eateries will not be making the April opening deadline as anticipated. Additions to the lineup include the love'em or hate'em cupcake maven, Warren Brown's Cakelove, Redrock Canyon Grill, and Timothy Dean Bistro among others. Award season is upon us with the announcements of the Rammy and James Beard Foundation nominees. The Rammy Awards will be announced June 29 at the Marriott Wardman Park Hotel. The James Beard Foundation Awards will be held June 6-8. Finally, if you missed your TomChat this week, a chatter inquired about the delayed opening of Co Co. Sala in D.C. Tom replied that the delay is due to customs holding a Italian-made bar which should be released shortly. Opening has been pushed back until late-April. 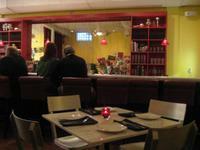 Sushi Ko, in Chevy Chase has opened with co-owner Russel Gravett "sneaking in an opening last Friday, March 22". With fuel prices as high as they've ever been, a messed-up environment as evinced by bizarre winter weather, and the decreased competitiveness of our currency, the onus is on us more than ever to think globally and drink locally. We residents of the DC metropolitan area are in a unique position vis a vis this proposition — few regions outside of Napa Valley offer a better wineries-per-square-mile ratio than Virginia wine country. Over 100 wineries strong and growing every year, Virginia winemaking is a boom industry amidst a landscape stricken by stagnation. Though its reputation is improving, I'm sorry to say that the suggestion of VA wine still leads to many an upturned nose. Now I'll grant you, quality is not superb across the board, but what wine region can honestly make such a claim? If you are one of the deriders, good on you for being skeptical, but propriety demands that I ask you not to knock it till you've tried it — and the best place to try it is at the source! If your travels take you anywhere south or west of the beltway, options abound for the adventurous drinker looking for an excuse for a quick glass, some beautiful scenery, and in several cases, some really good food. On a recent trip to the south Eliza and I hit the back roads and visited a few of the wineries south of Route 64 between Stauton and Charlottesville. In what I hope is the first in a series, here are my experiences at a few of those places. Following convenient signs on the highway, about 6 miles of driving up narrow, hilly country roads brought us to the unvarnished wooden home of Afton Mountain Vineyards. At 960 feet above sea level, Afton produces some of the highest elevation fruit in the state of Virginia; elevation is actually an important facet in grape growing, as higher vineyards keep grapes away from low-lying pollution, allow for sunnier days and cooler nights, and give the eonologist a more difficult but rewarding soil to cultivate. Afton is one of the few wineries of its output (about 5,000 gallons annually) to utilize a gravity flow vinification process, which keeps stress on the grapes to a minimum and yields higher quality juice. Afton's tasting bar is a quaint affair, tile floored but comfortable, where tasting room staffer Brian (a friendly and knowledgeable guy) offers a selection of about 10 wines to taste. The offerings are eclectic for the state, including such oddballs as Gewurztraminer and Sangiovese, along with the ubiquitous Chardonnay and Cabernet Franc. All the wines were good, if a bit expensive — the Cabernet Sauvignon in particular struck me, being more pleasantly tannic than one usually gets in the area. What surprised me most was that Afton offers a Pinot Noir made from 100% estate-grown grapes, an animal almost unheard of in the Virginia wine menagerie. This wine was not up for sampling, as production is limited to a few dozen cases, but curiosity got the better of me and I bought a bottle, reasoning that I'd blown $20 on much stupider things. I opened the bottle a few days later, prepared for the worst; Virginia's generally moist climate is not conducive to growing the popular grape and few vintners have even tried. Only a few sips in I was rather impressed — a pretty burnt-leaves and raspberry nose, medium body, and good acidity give way to a very interesting woodsy, black-cherry finish. Having none of the green notes or low acidity for which Virginia wine has been condemned, I have to say that this wine was as well made as any Pinot I've had from the US for less than $25. Food: Cheese, crackers and baguettes available for purchase. Scenic picnic area. Wine Availability: Tasting room, website and wine club; otherwise, limited. Though only a 10 minute drive from Afton Mountain Vineyards, Veritas could not present itself more differently. In the stead of the small brown building offered by its neighbor, Veritas presents a grand estate. With a full wall of dramatic windows, cathedral ceilings and a sweeping green lawn, Veritas' tasting room and environs evoke all the charm of an old style Virginia plantation, without all the reprehensible oppression and such. Inside it's all old wood, rustic furniture and chandeliers, with a huge stone fireplace to boot — small wonder that in such a romantic setting, a couple of our fellow visitors quite suddenly got engaged! The basic tasting at Veritas is free, with an additional $4 charge for the high end and dessert wines — having heard good things, we decided to try the lot. Veritas' wines across the board may be called uniformly clean, with the new winery's thoroughly modern approach evident in each. The whites were round and full, most having seen a bit more oak than I would have hoped; the Viognier in this was most dissapointing, being a wine I usually characterize as fresh and fruity. The reds were similarly full and oaky, with the exception of the 2006 Claret, a blend of Cabernet Franc and Petit Verdot that was spicy, bright and racy. By far the most impressive of the group was the 2005 Mousseux, a pink sparkler created with the aid of esteemed Champenoise winemaker Claude Thibault. Produced using the labor intensive Method Traditionelle (where the bubble producing second fermentation occurs in the bottle), this 50% Chard, 50% Cab Franc is elegant and trim, featuring fresh strawberry on the nose and a very bright and slightly sweet finish. While not as toasty as the French stuff, the Mousseux is one of the better Virginian sparklers I've had, and I hope it marks the beginning of great things for this young winery. Food: Cheese and crackers at the bar. Full menu by resident chef available for special events. Beautiful picnic space abounds. Wine Availability: Widely distributed throughout Virginia. A few more miles east on Route 6 and north on Route 20, we were on our way back to the highway with just enough time for a stop off at Kluge, Albemarle county's premier winemaking estate. This gargantuan 2,000 acre facility was founded in 1999 by Patricia Kluge, a woman who has led an... interesting life (I won't get into it here, but read this article and you'll see what I mean). With ten-fold the capital of even her extremely affluent neighbors, Patricia's start in the wine biz was far from typical of the east coast vintner — having brought on the best growers and winemakers money can buy, including the services of superstar consultant Michel Rolland, Kluge's wines quickly gained national renown. I started out a bit wary of this estate at the get go, and only grew more skeptical as we drove up the wooded hill to the impeccably neat and tidy tasting room. 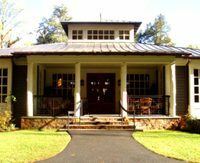 The whole affair seemed out of place for the Virginia winery scene: figuratively in the amount of money that Kluge had been thrown down in this developing wine region, and literally in the form of this cutesy "farmhouse" before me. Though, it had been my morbid curiosity that had brought us out of our way to get there, so in we went. In appearance the tasting room at Kluge is very reminiscent of those I'd visited in Napa Valley: classy and comfortable in a Disneyesque sort of way, with lots of stuff for sale. The main room is arranged around a display case featuring an array of foods both hot an cold available from the on premise kitchen. Where most tasting rooms feature a bar and a wine-by-wine orchestrated tasting, at Kluge patrons order their food and wine with a cashier and are led to a side room for table service. We ordered a cheese plate (about $8), a bowl of truffled olives (about $4), and two full tastings ($10 each), and were led to a small sunlit table. Our cheese and wine came out promptly, with six wines served in conical plastic cups supported by a large stand — as had been promised, the servings were ample, totaling about two full glasses each. The server took a moment to explain each of the six wines before us, and suggested which might go best with each of our several cheeses. After that, we were left to our own devices. The wines and cheeses were all good, even great in some cases; of particular note were the olives, which were tasty and made a great palate cleanser with a bit of sparkling wine. The most unusual wine in the mix was the Cru, a fortified Chardonnay aged in Jack Daniels barrels for six months prior to bottling — the spicy/sweet nose and syrupy body did indeed make this a good pair with our blue cheese, though I would have liked a bit more acidity. The Albemarle Simply Red 2004 and Albemarle Rose 2006 were tops with me — both Bordeaux blends showed the French winemaker's soft touch with wood and extraction, leaving the wines elegant and balanced where they could easily have been mawkish and awkward. The estate's flagship New World Red 2004 was also quite impressive, but in need of a few years aging before it really begins to show. We left with full stomachs, a slight buzz, a couple bottles of the Rose, and the knowledge that throwing a lot of money into a project can in fact yield some great things. 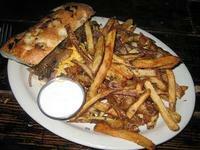 Food: Full menu of light to heavy fare, available until about 3:30 for purchase. Wine Availability: Widely distributed throughout Virginia, DC and beyond. Pictures courtesy of the respective vineyards' websites. 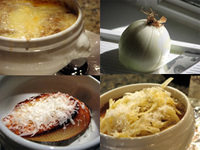 French Onion Soup is one of my favorite soups. 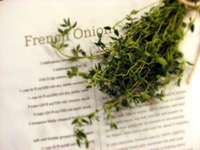 While eating it is wonderful in the winter, I enjoy French Onion Soup year round. When the mood strikes, I buy a bag of onions, break out my cheap mandoline, don my goggles (seriously) and get slicing. Once the drudgery of slicing what seems like a bushel of onions is done, the rest is smooth and tearless sailing and I can just enjoy the smells as they fill my kitchen. What I really like about this recipe is the cocktail of spirits it includes. I think alcohol adds a special and distinctive essence to food, and the changes in flavors once alcohol is imparted are fascinating. With a cheesy cap and crouton tucked inside, this soup is stick-to-your-ribs satisfying. Peel onions and slice thinly. In a heavy bottomed pot, add olive oil and butter over medium heat. Add onions and turn the heat down to low. Stir to coat all onions. Add a pinch of salt and allow to caramelize slowly over a period of approximately 2 hours. Stir every 10 minutes or so. When onions are deep golden brown, transfer to another bowl. Increase heat to high and deglaze pan with vermouth and white wine. Scrape up any brown bits on bottom of pan and allow liquid to reduce by half. Return onions to pot and add chicken and beef broth. Add bay leaves and thyme. Partially cover pot and allow soup to simmer for 20 minutes. Add sherry and continue to simmer for 5 minutes. Remove bay leaves and bundle of thyme. 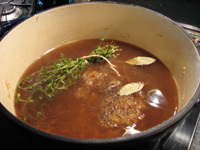 You’ll notice that many of the thyme leaves are now in the soup. Salt and pepper to taste. For the croutons, turn on broiler and slice baguette. Place croutons on baking sheet. Oil each side with olive oil, and sprinkle salt and pepper. Place croutons under broiler and brown on each side. Leave broiler on and place one crouton into individual oven proof serving crocks. Add 1 tablespoon of grated pecorino on top of each crouton. Ladle onion soup over croutons to 1/4 below the rim. Add shredded gruyer to the top of each crock. Put crocks back on baking sheet and place under broiler until cheese is melted and bubbly. When Cheesetique opened in its new location last month, one of the most exciting developments was not yet in place. As I mentioned in my write-up, proprietor Jill Erber's big plans for the new space included a cheese & wine bar at the rear of the shop. This week, those plans came to fruition with a Tuesday night opening. Fans of the cheeses and charcuterie sold at Cheesetique can now enjoy them paired with wines by the glass in a casual dining environment. Reminiscent of a small bistro or cafe, the space is dominated by a white marble bar that runs the length of the left-hand wall. Behind the bar, large smoked-glass mirrors and red shelves give the space a warm and friendly character. The remainder of the cozy dining area features table seating (marble makes another appearance on the unadorned tabletops) for roughly thirty guests at any given time. And those guests are in for a treat. Chef Cat's menu goes beyond meats and cheeses in delicious, if predictable ways. Several salads and sandwiches are available at very reasonable prices, with none of the entree offerings coming in over $10. Artisanal quiches and panini featuring a variety of fillings will rotate on and off of the menu on a regular basis - the prosciutto panini we ate on our visit was definitely a highlight of the meal. 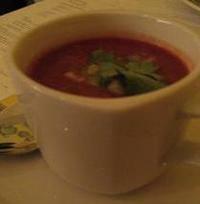 And the gazpacho that accompanies the upscale grilled cheese packs a delicious chili pepper heat in with the crisp, cool chunks of cucumber that swim in the tomato base. The soup is available on its own for $3, a bargain compared to standard restaurant fare. Even so, the stars of the show are naturally the meats, cheeses and wines that you would expect to feature prominently in this setting. Though you might anticipate the entire catalog of cheeses to be avialable in the bar, there is actually a small but diverse selection of ten different cheeses. They are featured on the Cheese Cart that stands at the ready beside the bar and can be wheeled to your table to show off the goods. Our choices included a triple-cream brie, a honey goat cheese, a raw-milk aged cheddar, and a pair of blue cheeses among others - enough to give us pause, but not as many options as we might have hoped. These cheeses can be enjoyed on their own or in groups, and they come served with fresh, crusty bread. 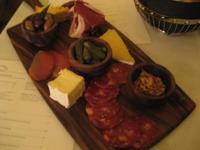 If you're looking to make a more substantial plate, a variety of charcuterie choices are also available. They range from the familiar (prosciutto, soppresata) to the more unique (lomo - a cured, pressed pork loin that was rich and flavorful). A combination of three cheeses and three meats that comes with cornichons, olives, grainy mustard and bread runs $25, and it is a great way to experience a diverse group of flavors in one sitting. The advice of your server can be invaluable as you try to balance your order - but don't hesitate to focus on your favorites if you know what you like! 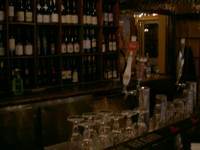 Cheesetique's bar offers almost two dozen wines by the glass or the bottle, with prices starting at $7 per glass. They run the gamut from sparkling wines to dessert wines, with a wide range of reds and whites to choose from. Some basic pairing notes are included on the menu, but again your best bet is to ask your server for a recommendation to make sure your pinot noir and your Parrano don't clash. A selection of beers that match up well with cheeses is also available, and the connection between the restaurant and the retail space is reinforced by a 10% discount offered on the purchase of wines that are featured in the cheese bar. As with any completely new venture, there are still some small kinks to be worked out - the most noticeable is the Cheese Cart's inability to navigate the spaces between some of the tables when filled. Additionally, my wife's order was inadvertently delivered to another table, resulting in her sandwich arriving just as we were finishing my panino. But the service was very friendly and quick to respond, and the team at Cheesetique seems like they are already off to a great start with only one night's service under their belts. 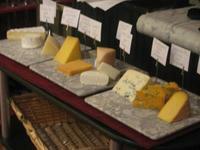 Cheesetique's Cheese & Wine Bar is open Tuesday through Saturday from 5 PM to 9 PM, and they do not accept reservations. 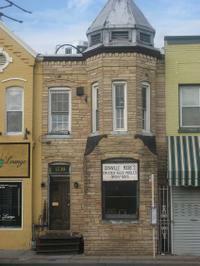 They are located at 2411 Mount Vernon Avenue, in the heart of Del Ray. Street parking is available, and there is a small lot on the block for patrons. Heard around the DC Foodies blogosphere this week...a lot to talk about this week folks, so strap yourself in; we're in for a fun ride! 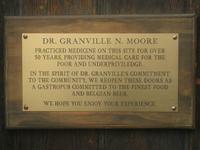 So, you read Mike Bober's post on DC Foodies about Granville Moore's this week. 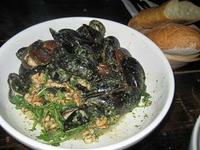 The "little kitchen that could" turns out the best moules and frites in DC, according to Chef Teddy Folkman. This week, Chef Folkman put his moules where his mouth is when he received a challenge from none other than Iron Chef Bobby Flay. On Tuesday, under the ruse that Food Network was filming a segment for "America Eats", Chef Folkman accepted a challenge from Chef Flay, for a Moule and Frites Throwdown. 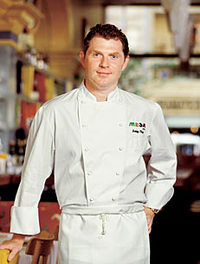 Flay's show, "Throwdown with Bobby Flay", has Flay surprising unsuspecting cooks, bakers and chefs while they demonstrate making their signature dishes. Be it crab cakes, gingerbread houses, or macaroni and cheese, Flay does his homework and shows up ready to rumble. If, that is, his challenge is accepted. Not only was Mike there, but the two judges for Throwdown Moules and Frites were none other than DCFoodies.com founder Jason Storch, and his wife Amy. When asked if he could reveal the results of the challenge, lest he face the wrath of the 5 point exploding heart technique, Jason responded that he could tell me, but then my internet would be cut off for the next 3 months or so. You can talk smack about my Momma, but don't cut off my internet. The show is set to air sometime in May or June. I guess we'll all find out together. Check out Endless Simmer and Frozen Tropics for more of the inside scoop and photos. DC food bloggers and writers Amanda McClements of Metrocurean, and Melissa McCart of Counter Intelligence did a fun and informative radio segment with Washington Post's Marc Fisher. 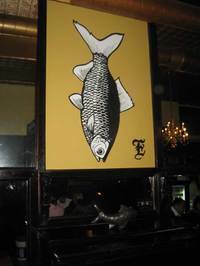 Fischer's column, Raw Fisher, covers daily life, politics and culture in the DC region. McClements and McCart dished about DC bloggers, farmers markets, food trends and restaurants. Just in time for Spring, Indigo Landing, with its fabulous deck, reopened on Thursday, March 20th. Minus the Star Restaurant Group, Guests Services, Inc. is launching the latest incarnation of Indigo Landing with Executive Chef Ernesto Pabico. Look for entrees such as Hickory Roasted Prime Rib with a creamy horseradish sauce and natural au jus, which is prepared on a wood-fired grill from 100% Red Angus Beef raised in the U.S.A. Coconut Grilled Lobster, and Blue Crab Sliders on mini brioche with stone-ground mustard mayonnaise and Shaker Corn Relish also sound tempting and nod to the restaurant's waterfront location. Live Jazz will fill the air on Wednesday evenings, and during Sunday Brunch. 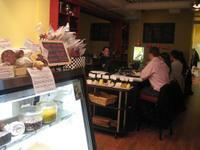 Earlier, DC Foodies reported that Murky Coffee in Capital Hill was closed because of tax issues. Apparently, the worst case scenario is playing out, as the D.C. Office of Tax and Revenue has seized the operation. According to today's Washington Post Metro section, Murkey Coffee owes more than $427,000 in sales and franchise taxes. Owner Nick Cho disputes the amount and states that he owes about $200,000 at the D.C. site, and approximately $20,000 at the Virginia site. This is already fueling speculation and concern for the fate of the Clarendon branch, on local boards such as Don Rockwell. On a much lighter note, Apples and Bananas reported this week that the fry plate is back at Palena, while Endless Simmer came up with a really fun list of "Americas Top 10 Drunk College Foods" for March Madness. Be sure to check it out and add your favorite hazed memories! While all the country was caught up in Bourdain-mania (Bourdania?) a few years back, I was decidedly left behind. I missed the brief run of A Cook's Tour on the Food Network, and then No Reservations passed me right by. A friend asked me if I'd seen the Travel Channel special in which the intrepid chef was trapped in Beirut during the Israeli bombing of Lebanon; I feigned knowledge so as not to seem completely out of the loop. By now most of the hype surrounding Chef Anthony Bourdain has died down, and of course that means I'm just getting into the guy. Having read A Cook's Tour and Kitchen Confidential in the past year, I was both excited and a bit taken aback when I learned that Les Halles, Tony's former digs, has a franchise right here in DC. I was nonplussed in that a) I'd assumed that the man I had begun to admire so would never helm a place that would spawn a chain, and b) I'd realized that I had walked by this place many times in the past several years and never put it all together. Ah well. On a whim some friends and I made a reservation for Sunday brunch. We walked up in the wee hours of the weekend morning (i.e., 11:30) and made our entrance. On first blush, only one word can properly describe Les Halles: Cute. 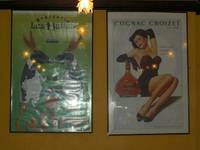 A red awning outside tops a quaint outdoor patio; inside, tchotchkes and posters of French-kissing cows grace the walls, and a handsome little bar is set off to the side — though it be a French restaurant, one could never give Les Halles grief for being stodgy! That said, the hostess was very polite and professional; she asked if she could check our coats, and promptly led us to our table. It was early for a Sunday and the place was dead. As we were saving room for an extraordinary brunch, we'd all skipped breakfast and were famished. I can safely say that come early afternoon we were all quite sated. Since that first encounter I have visited Les Halles several times, and the best advice I can give is that regardless of your intended meal, make sure you come hungry. While the environment and the hype might scream "cheesy tourist rip-off," I assure you that this is not the case. 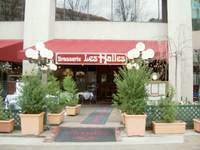 Les Halles is one of the best bargains in the downtown area for the local Francophile, offering some on the most well priced French bistro treats I've found in the DC area. On my second excursion, my girlfriend Eliza, our friend Matt, and I went by for dinner, and thinking ourselves up to the task we each ordered an appetizer. My escargot was impressive for the price paid ($7.50 for six); garlicy and oily as expected, but with a good deal more earthy goodness than your average midrange mollusk. My snails wound up the smallest of our indulgences, amongst Matt's very large portion of excellent country-style pate and Eliza's 1/2 pound of beef tartar, which is labeled on the menu as a "half portion," and modestly priced at $8.50. Suffice it to say that all three were, if not terribly innovative, delicious, well executed, and very generously apportioned. As for entrees, the same general rule applies: don't expect to be surprised, and you won't be disappointed. My hanger steak was simple but well prepared, if a bit rarer than the medium-rare I'd requested. Matt opted for the boeuf bearnaise and felt similarly; though a bit underdone the meat was good, and the bearnaise sauce "one of the best [he's] had." Hands down, Eliza's duck confit salad with truffled potatoes was the winner; the canard was rare and perfect, the frisee greens crisp, and the potatoes rich, but not overly truffled. While the draft beers number a sad three, there is a good selection of bottles to be had, including several Belgian 750s at under 2x retail, which is pretty good for a bistro. The wines-by-the-glass list numbers around twenty, incorporating an eclectic selection of wine from such places as Provence, Mendoza, and New York, ranging in price from $6.50 to $20.00 a hit. I found the glasses offered to be a bit overpriced, so we took a look at the bottle list, which offers a thorough selection of wines from France and elsewhere at very reasonable prices. On Mondays Les Halles offers the entire list at half price, which leaves many of their wines at or below retail — if you ever wanted to drop the cash on a bottle of Dom or d'Yquem, you can do so at Les Halles without feeling fleeced. In the near future, they will be offering Chateau Mouton Rothschild 2001 — one of France's finest wines in that given vintage — by the ounce, allowing the layperson a taste of the best of the best. Service has been admittedly mixed; our brunch was a bit late in arriving, and our waiter at dinner was way over sat, and therefore not as attentive as we would have liked. Also, our bottle of Elisabeth Chambellan Chateauneuf du Pape 2005, while delicious and well priced, required an ice cube or two to reach potability. That said, I was well attended by the bartender on a recent quick lunch stop, and my beer was cold, so I will have to reserve final judgment on these points. Overall, I would place Les Halles in that rare and wonderful category of DC restaurants where a full dinner is just way to much, but a half meal will leave one full and thrilled. If you've visiting guests from less metropolitan areas, Les Halles is a great place to introduce them to French cuisine without intimidation or bank account depletion. Just don't eat the fish on Monday — though I'm sure the mussels are always good, Chef Bourdain just wouldn't approve. Parking: Limited street parking on Penn Ave and surrounding streets. 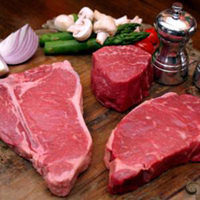 Cibola Farms, located in the foothills of the Blue Ridge Mountains, is one of my favorite meat producers at the farmers markets. Started in 1999, Cibola (pronounced cee-BOL-a) raises buffalo, pigs, goats and chickens using sustainable and eco-friendly farming practices on 300 acres of land. They offer a wide array of products including sausages and jerky. Recently, I bought a pack of Cibola's cranberry pork and buffalo sausage and decided to use it as a stuffing for pork. The taste is amazing with savory spices, sweet cranberry, and the slight gaminess of buffalo. Give it a try! Heat pan over medium-high heat and add olive oil. Add onions and saute until transluscent- about 5 minutes. Add sausage and brown. Chop sausage into small pieces using spatula while browning. Add bread and stir to incorporate. Add chicken broth slowly, allowing bread to absorb the broth. Continue cooking over medium heat for 5 minutes. Adjust salt and pepper to taste. Set stuffing aside and allow to cool. In a pan, melt butter over medium heat and add shallots. Saute shallot until translucent; about 3-4 minutes. 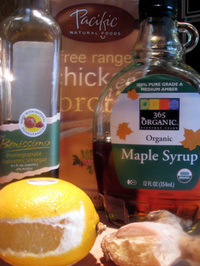 Add balsamic vinegar, maple syrup, chicken stock, ginger and lemon peel. simmer uncovered until the sauce has reduced by half. Set aside. Slice each pork loin in the middle, but not all the way through. Fold top flap over and lay loins out flat. Pound each pork loin until they are even thickness throughout. Cover one side of each pork loin with sausage stuffing (you may have some leftover --- don't over stuff). Fold top flap over stuffing and tie each pork loin with kitchen string. Generously salt and pepper each pork loin. In a regular (not non-stick) skillet, place olive oil and heat over high heat until the oil shimmers. Place the pork loins in skillet and brown on all sides. Place pork loins in a roasting pan, and put into oven on the middle rack. Roast pork for 15 minutes at 425 degrees, then turn the heat down to 325 degrees and continue to cook until the internal temperature reaches 145 degrees (if you are uncomfortable with medium doneness for pork, continue cooking until the internal temperature reaches 160 degrees. See chart). While pork is roasting at 325 degrees, baste it with maple syrup about 3 times. Allow pork to rest at least 10 minutes before cutting kitchen string and slicing pork into serving pieces. 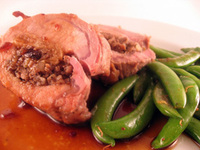 While pork is resting, reheat the reduction sauce and liberally drizzle over the pork and plate for serving. *I used cranberry buffalo and pork sausage from Cibola Farms. Be creative! **If you can't find pomegranite balsamic vinegar, use regular balsamic vinegar. Be creative! On the corner of King and S.Washington St. in Alexandria, stands Eamonn's, the small fish and chips "joint" that brings bold flavor to a normally bland dish. If you're expecting something grandiose or luxurious because it's associated with the Armstrongs, just forget about it. As I was sitting there waiting for my food to come out, a guy walked in the door, looked around, and said "This is it?!" What were you expecting dude? Eamonn's is anything but your fine dining establishment, but that doesn't mean that the food will leave you disappointed. 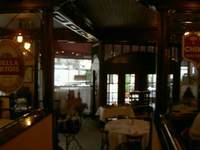 I recently went there with Mike Bober, another one of the writers here at DCFoodies.com, and we basically ordered the entire menu (relax, it's not very big). Here's what our experience was like. If you didn't get the point already, the dining room is very small (four tables in total and a bar with 3 seats) and the seating is first come, first sit. Don't sit at a table when you first come in, but go up to the cash register and order. 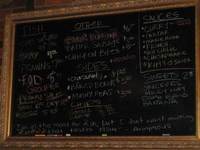 The menu is on the chalkboard about the cash register, and to your left, you'll see the sole tap of Guinness ($5.25 for 16oz in a plastic cup). The menu is simple with Chips, Fish, Sauces, "Other Stuff", Fried Sweets, and Booze, and everything is a la carte although you get one container of sauce per fish or "other stuff" you order. Chips come in small ($2.50) or large ($3.50) and aren't crispy and light like Belgian frites, or even your local fast food place. Quite the opposite, they're thick cut and greasy. I don't know if the point is to try to be authentic chips, I wouldn't know because I've never been to Britain, but I didn't care much for them. The day that Mike and I were there, they had a grouper special so we ordered that instead of the regular cod. The grouper had a nice texture and flavor, not too fishy and was meaty enough to hold together when we dipped it in the sauces. We also has some of the Ray (or Stingray), which comes with the bones in it. The bones are more cartilage than hard bones, but you'd best pick them out before attempting to eat the fish. We found that the ray was rather difficult to eat. The breading on the fish could've been crispier in the end. 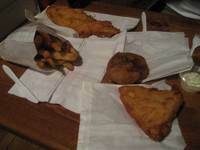 We also tried the fried battered "burgher", which is exactly what it sounds like. There are no cheese or bun options, but the burger is deep fried in batter and very well done. But that doesn't matter much because it's absolutely amazing and decadent, and I thought it was the best thing we ate there. The sauces are really what make the meal at Eamonn's. Our favorite was the spicy curry sauce, which wasn't too heavy or creamy at all. I was half expecting a curry mayonnaise, but this really not that thick. All of the sauces were pretty good, but our favorites were the Marie Rose (think McDonald's special sauce) and the Fronch (French). To finish off our meal, I couldn't help but get the deep-fried Snickers. This was my first deep-fried Snickers and until I had one, I really didn't know what I was missing. They batter and deep-fry the Snickers, and then dust it with cinnamon sugar. It comes out hot and oozing, is nothing pretty to look at, and is messy to eat, but it's worth the trouble. At about 7 PM, I noticed the person who was running the front reach up and up some of the prices about $0.25 and $0.50. It seems that if you get there before 7 PM, they give you a discount. Perhaps it's a happy hour special. After the meal, we exiting Eamonn's and attempted to get into PX, which lies upstairs from The Chipper, but alas, we were rejected like the common scum that we are. Actually, they were fully booked so next time I'll think ahead and make a reservation. Instead, we walked down to the Restaurant Eve Bar and had a couple drinks there, which were probably just as good in the end. As for Eamonn's, if I were a local to Alexandria, I'd probably be there quite often, especially given the other option of the Popeye's a few doors down. However, I don't think it warrants a special trip to Alexandria just for the fish and chips. Parking: Street or Pay lot around the corner. Baby-Child friendly rating: 2 diapers - no child seats or kids menu, but it's a casual environment so it's definitely a place you can bring small children. Heard around the DC Foodie blogosphere this week...from The List Are You On It, 100 King, in Alexandria's Old Town neighborhood, is now 100 Prime. Under new ownership, 100 Prime will be serving upscale steaks and seafood. Right across King Street, The Fish Market (written about by Rob Rutledge recently) is set to be bought next week, by the neighbor restaurant owner of Landini Bros. After 32 years as owner of The Fish Market, Glenda Giovanni is looking forward to retiring. Read the details about the changes on King Street in the article from The Alexandria Times. Metrocurean tells us that Hank's Oyster Bar will be having an Oyster Fest on March 30, from 1 to 4 pm. For $65 per person, all you can eat oysters will include New Points and Rappahannocks from the East Coast, and a selection of beer. Tickets are available at Hank's Oyster Bar in Dupont Circle. This week, a surprise 60th birthday party was thrown for Chef Michel Richard at CityZen restaurant. You can get the inside scoop from Sauce on the Side. 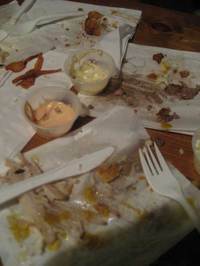 Apparently, the Parkerhouse rolls were delicious, and plentiful. The Washingtonian's Best Bites blog bring us an early look at Bice-the new restaurant occupying the space where the Old Homestead Steakhouse used to be. Most intriguing perhaps are the "purse holders" at each seat and the aperitivo happy hour, weekdays from 5-7 pm. Free Italian finger foods, half price drinks and occasional live music sounds like a great way to unwind after work. Finally from today's Washington Post Weekend section, Eve Zibart reports on Big Buns Gourmet Grill, on Wilson Blvd. in Arlington, VA. At Big Buns, you can build your own burger from hamburger, chicken, mahi-mahi, or portabello mushrooms. From there, you choose your bun, cheese and toppings. 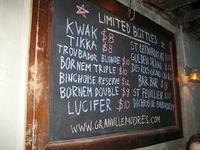 They also serve a few beers. Look out 5 Guys. Or not.